The Dead Sea feels more like Mars than Earth. 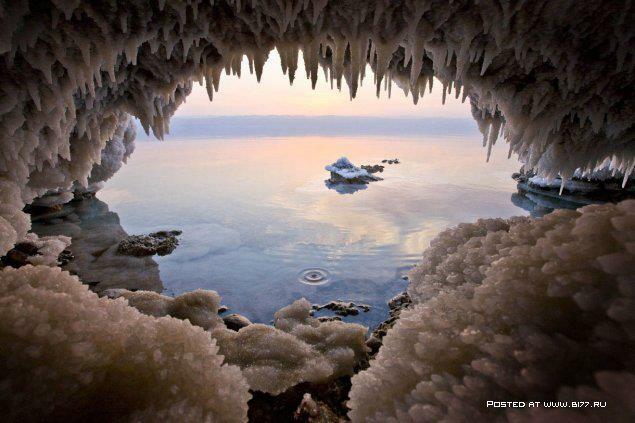 At up to 423 metres below sea level, the surface shore of this hyper saline sea is the lowest land on Earth. Sea water is on average 3.5% saline, the Dead Sea: 33.7%. Temperatures climb past 40 degrees Celsius in the shade. This is a place where almost nothing seems able to survive. It’s just a big salty sea ringed by mountains that loom through the hazy, hot, salty air. Perfect place to go kayaking! My mate Mick is an Aussie winemaker living in the north of Israel. In addition to a full cellar of wine, Mick has a giant 2 man kayak (pictured below). We mount it to the roof of his car and set off for the Dead Sea – in one car each. Leaving one car at the northern tip, we drive south to camp the night at Masada on the southern tip of the Sea. On the water the next day at dawn, I am struck by the lifelessness of the water and its surrounds. The water is so salty that in spite of us not actually swimming in it, we’re soon covered in a greasy, salty second skin. After a full day paddling over 60kms, you’re hurting. The muscles around your neck and shoulders, wrists, arms and entire back plead with the brain to stop. But the human body is an incredible machine. It can take more than most people allow it to. We’re engaged in a physical and mental battle, but there’s still time for a moment of reflection. 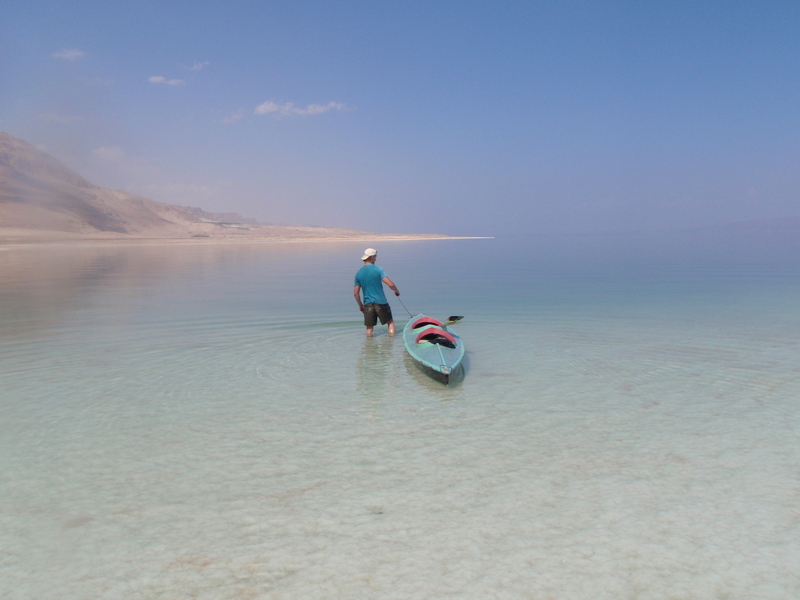 Two mates from Australia paddling the Dead Sea in the Great Rift Valley, often referred to as the cradle of life on earth. The sun just above the Israeli mountains to the west and the moon making its first appearance for the night ahead. I feel a sense of wonder. How incredibly lucky we are in this moment to be able to follow our dreams and practically do what ever we wish. The romance of the moment however is short lived. In fading light we are struck by the realisation that we must get this kayak out of the water and fast. Problem: the area is hemmed in by 10m high cliffs. It’s now after 7pm and we’re paddling in complete darkness. Every time we see a break in the cliffs and get out of the kayak, we step into soft, sticky quicksand like mud that envelops us up past our knees. There’s no way we would be able to carry the kayak through this mud. Just when we think things can’t get worse, we see two vehicles with large spotlights sweeping their roof mounted beams of light over the Sea in an apparent search for…us!? The situation was deteriorating fast. Only 30 minutes ago we had been bathing in a glorious sunset, now we possibly had border police or military searching for us in the dark on a hyper-saline body of water surrounded by quicksand. Eventually, we find a good a spot to drag the kayak out of the water. The mud is a little thicker here, but large ominous sink holes are scattered like craters on the moon. We must be vigilant; this has the potential to end badly. We decide to walk up to the highway first to assess the best route out before taking the kayak. Not more than 100 metres into the 200 metres or so between the water and the highway, our world is rocked. Previously battle ready Israeli commandos realise we pose no threat. We walk up to meet them. Shirtless, barefoot, and covered in mud, salt and sweat. They are genuinely angry and suspicious. The highest ranking officer in a purple beret does not speak English, but is the angriest of all and stands in front of us casting a physically threatening presence. A more level headed soldier steps forward and explains that no vessels are authorised on the Dead Sea. It is a border area and there is a considerable security risk from the Jordanian side. “You should not be here,” he says with genuine concern. We apologise for our ignorance, and adequately explain ourselves. Crisis averted. After a ride in an Israeli Defence Force Hummer to pick up the car, we load the kayak and head off home. If you were given a return airfare anywhere on Earth right now, where would you go and what would you do? I have spent a huge amount of time down at the Dead Sea (Israeli side), camping, swimming and generally reinvigorating. What a special place! Just to mention, I have seen two guys paddling on a flat canoe. I made my way i would estimate to about the half-way line that separates Jordan and Israel, but became a little un-nerved, so decided to paddle back. There is a lot of military in the area, but they generally leave you alone…..just behave! !